If you've shot using both iron sights and a red dot sight, it probably didn't take long to see the benefits of the latter option. Red dots offer faster target acquisition and a better overall shooting experience compared to irons. Unfortunately, quality red dot sights have historically been priced outside of many shooters' budgets. While the best red dot sights still usually cost $400+, budget manufacturers have come a long way in the quality they offer, and there are some great options available today. In this guide, I'll be covering the best budget red dot sights under $200 for your AR-15, pistol, or any other gun. For those of you looking to spend as little as possible, I'll even cover some options approaching and below $100. For those of you in a hurry, here's a quick preview of our picks. Quick Note on Price Variability - Prices on all firearm products and accessories tend to vary a great deal. Though they've generally been trending downward, there is a chance some of our picks might be slightly above of our $200 limit when you read this. For starters, they have a wide range of products priced under $200. Furthermore, based on our own testing and use, plus what we've gathered looking through other research, they're generally the most durable brand among budget options. Finally, some of their products also come packed with features not found elsewhere, even on some higher-end optics. Many of these features are geared towards expanding battery life (up to 50,000+ hours), something that was unheard of in the past for budget optics. All of these things combined make Holosun a great choice for a budget red dot sight that you can use for the range, self-defense, or just about anything else. After reviewing countless options, I've chosen Holosun's HS403C as the best red dot sight under $200 for an AR-15 or another rifle/long gun. 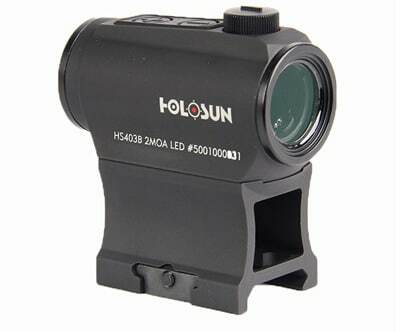 Holosun is famous for its "Solar Failsafe" technology, which is included as a feature of the HS403C. It allows the optic to use energy from light, both natural and artificial, to power it. It can also use battery power in low light conditions. These two power sources act as a backup for each other, meaning the sight should always be powered. The solar array atop the sight also acts as a light sensor to automatically adjust the brightness of the optic to your surroundings. According to Holosun, the battery life alone can power the HS403C up to 50,000 hours, though they do not specify on what brightness level. With that said, I'm confident my HS403C should have no problems always being kept on with the automatic adjustment feature for at least a year. I'd replace the battery at this point as a precaution if you plan to use this for anything serious. 2.44" X 1.18" X 1.45"
The HS403B is basically the HS403C without the Solar Failsafe technology. This missing feature does, however, lead to it being even cheaper in price. With its default settings, it automatically "goes to sleep" after 8 hours, but it turns back on if it senses any movement. Vortex is another optic manufacturer that I'm a huge fan of. I've used everything from their red dot sights to rifle scopes and binoculars. The company has a wide range of products at varying price ranges, including budget red dot sights around or under $200. What really separates Vortex from other budget manufacturers is their quality control and warranty. I've never had any issues with Vortex products, but even if I did, they have a no questions asked warranty. Okay, this one isn't always priced under $200, but it's the most budget-friendly pistol red dot sight I'd ever use for anything serious. Affordable reflex sights that will fit a pistol are harder to come by than larger red dots that can be used for AR-15s or other rifles. The Venom is available with either a 3 MOA or 6 MOA dot size. While it's most often used for pistols, it also comes with a Picatinny mount for use on rifles, shotguns, and carbines. It uses a CR 1632 battery that can last up to 30,000 hours on the lowest setting and 150 hours on the brightest setting. The Venom has 10 brightness settings in total, and it offers automatic brightness adjustments, as well as an automatic shutoff after 14 hours. I also love that the battery can be replaced from the top without needing to remove the optic. Vortex's Venom sight has an ultra-low profile and weighs just 1.1 oz. The Sparc II is likely the most rugged red dot sight you'll find for under $200; its robust housing and protective lens covers make it feel like the most durable choice on our list. It's also the largest optic we'll be covering in this guide (3.1" long by 1.1" tall, weighs 5.9 oz). In terms of performance, the Sparc II has exceptionally clear glass, especially for an optic at this price range, with a 22mm objective lens. Unfortunately, the Sparc AR is missing some of the features found in the similarly priced Holosun HS403C. The battery life is only 300 hours at max brightness and 5,000 hours at minimum brightness. It has an automatic shutoff feature after 12 hours but does not have motion sensors to turn back on like the HS403B. Personally, I prefer an optic I can always leave on and be sure it'll have power for use on a self-defense rifle, leaving me favoring the Holosun options above for use on my AR-15. With that said, the Sparc II is a good choice if Vortex's lifetime warranty is important to you. 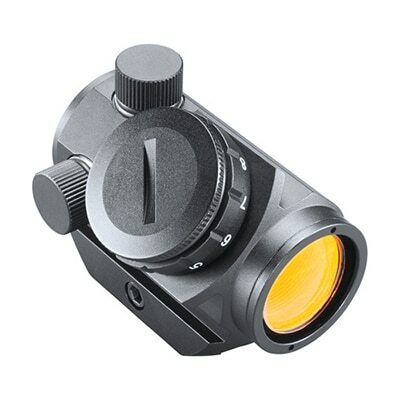 Priced below the Sparc II, the Vortex Crossfire is my favorite budget red dot sight for target practice and casual use. It actually offers far better battery life than the SPARC II at 50,000 hours on its medium brightness setting according to its manual. This setting is plenty bright for most indoor use or cloudy days. Though it doesn't have an auto-shutoff feature, you can turn it off by moving the dial between any of its 11 brightness settings. This makes it easier to quickly turn it on to the same setting you last used. I bought this for the lightweight AR-15 I use for plinking because it was so affordable, but it's also a reasonable option for a budget home-defense red dot sight. There aren't a lot of great options for red dot sights under $100, but the Bushnell TRS-25 is worth considering for casual range use. I wouldn't bet my life on it, but it gets the job done for plinking when you're on a tight budget and don't want to use iron sights. It does not come with a mount, but you can pair it with this cheap Picatinny Short Riser Mount. If you're on a budget, I'd choose the Holosun HS403C. In my mind, it's the best red dot sight under $200. If you're looking to save a bit more, Holosun's HS40B and Vortex's Crossfire are other great options. Under $100, you have the Bushnell TRS-25, but it's a noticeable downgrade from the other options on our list.